* Separate professional vibration sensor. Acceleration : 200 m/s2, RMS, PEAK, Max. Hold, g, ft/s2. Velocity : 200 mm/s, RMS, PEAK, Max. Hold, cm/s, inch/s. Displacement ( p-p ) : 2 mm, Max. Hold, cm, inch. 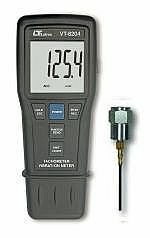 * Tachometer ( photo ) : 10 to 100,000 RPM. Tach. ( surface speed ) : m/min., ft/min. inch/min. * 1600 Data logger point. * Optional IR probe, IR-962.